Image caption HMRC said Rangers could now "make a fresh start"
Former directors of Rangers FC may face investigation and possible claims against them over the club's demise, HM Revenue and Customs (HMRC) has said. HMRC has rejected a company voluntary arrangement (CVA) from the club's potential new owners, meaning the Ibrox club will now be liquidated. It said this best protected taxpayers as a CVA could restrict the scope of possible action. HMRC said Rangers assets could now be sold, allowing it "a fresh start". In a statement, HMRC said: "A liquidation provides the best opportunity to protect taxpayers, by allowing the potential investigation and pursuit of possible claims against those responsible for the company's financial affairs in recent years. "A CVA would restrict the scope of such action. Moreover the liquidation route does not prejudice the proposed sale of the club. This sale can take place either through a CVA or a liquidation." HMRC said the sale of the clubs assets was "not being undermined" but simply taking "a different route". The statement concluded: "Liquidation will enable a sale of the football assets to be made to a new company, thereby ensuring that football will continue at Ibrox. "It also means that the new company will be free from claims or litigation in a way which would not be achievable with a CVA. Rangers can make a fresh start." 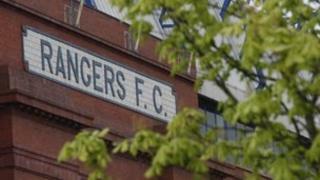 Rangers were forced into administration by HMRC on 14 February over non-payment of tax totalling about £14m. The Ibrox club was also in dispute with the tax authority over other unpaid amounts. Rangers used Employee Benefit Trusts (EBTs) to pay dozens of players during the last decade. HMRC issued a bill for unpaid tax on the schemes, believed to be in the region on £49m, including interest and penalties. Rangers contested this at a First Tier Tax Tribunal which concluded in January and is due to issue its determination imminently. It is believed the potential EBT liability facing the Ibrox club could now be as high as £75m, including penalties and interest. A consortium, headed by Yorkshireman businessman Charles Green, emerged several weeks ago as the latest preferred bidder for the club. Along with joint administrators from Duff and Phelps, Mr Green produced a CVA proposal which is due to be the subject of a vote by creditors on Thursday. If accepted by more than 75% of creditors, the CVA would have allowed Rangers to exit administration by paying an agreed sum - pennies in the pound - to creditors. HMRC, which holds more than 25% of the debt, has effectively blocked this by indicating its intention to vote against a CVA, meaning the club will now be liquidated. Once the voting formalities are over, the tax authority will appoint joint liquidators from BDO to wind up the 140-year-old football club. The liquidator has powers to examine the governance and administration of the club before its insolvency and report on any issues he feels should be raised with creditors. Among these powers, include the right to apply for a court order to examine, under oath, people involved with the company. The liquidator can also sell the assets and the business to pay off the debts and undo any dealings or trading which he deems to be void. The months ahead are likely to bring more scrutiny on the roles of current Rangers owner, Craig Whyte, and the man he bought the club from, Sir David Murray. It was during Sir David's 23-year reign that Rangers began using the controversial EBT scheme.